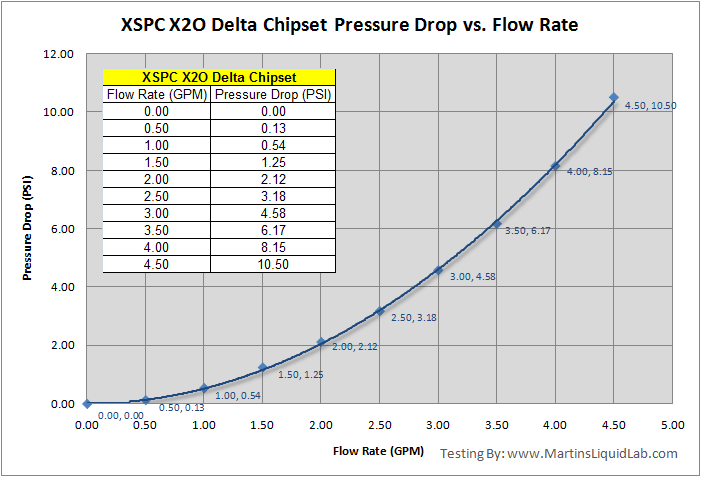 Welcome to my pressure drop testing of the XSPC X2O Delta Chipset block for a wide range of chipsets. This page will focus on the pressure drop and flow characteristics only for this water block only. First I would like to give special thanks to Paul from XSPC for providing me with a sample to test, I have yet to try and XSPC product that didn't impress me. Being the engineer that I am, I tend to take notice of the small tweaks here and there that make a product perform well, and XSPC obviously spends a lot of time working on improving their own designs and it shows. The block is a finely CNC machined block. The base is a circular solid copper base with very very fine diagonally cut square micro-pins. There is a large number of pins. I was pleasantly surprised to see the pins up close, they are very well machined for such fine and difficult thin cuts, all of this will result in a very large heat transfer surface area which is good. 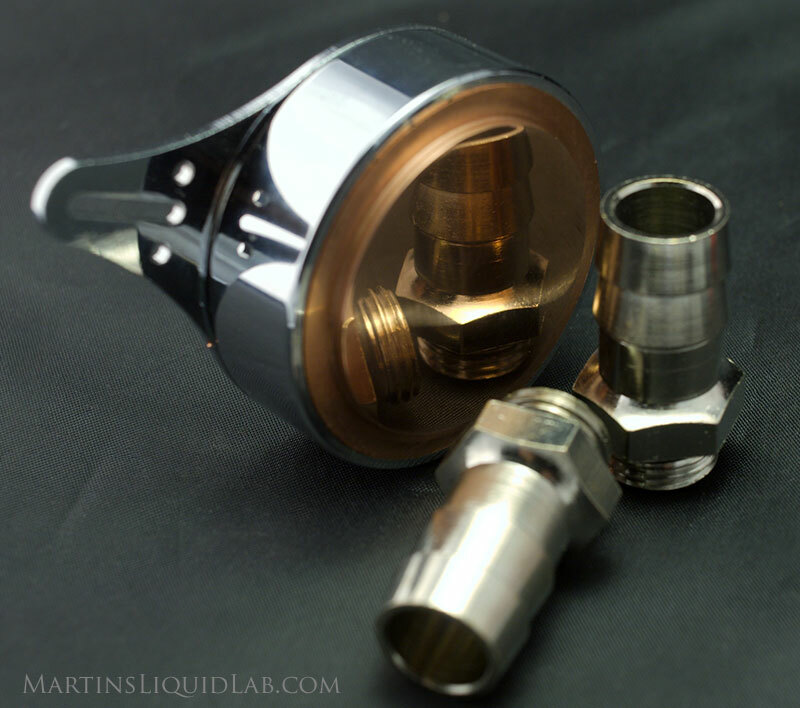 The top is a machined brass all metal top with a chrome finish. I really like the unique look it gives and the all metal construction ensure long term durability. This chipset block would also go extremely well with the X2O CPU block as they have very similar features and looks. Below is the package that you get including the block with chrome top and chrome hold down plate, a back plate, hardware bolts, TIM tube, and hold down clips. Wait...did I say Back-plate!, yes! For the first time I've reviewed, we have a nice solid steel with neoprene back-plate included in the package, that is an extremely nice surprise and welcome addition. As I mentioned above it's items like these that are intended for performance. That's great!! And for a close up look at the CPU style performance pin matrix, you can see below using a macro extension tube setup, that the pins are extremely well made. These micro pins will add up to several times the heat transfer area of a flat base chipset block like the MCW-30. This is where the performance is at...in lots of copper surface area. And the base is a mirror like shine as usual, looks very straight and true and finely finished. The XSPC X2O Delta Chipset block is a free flowing block with minimal pressure drop against similar pin matrix style blocks! 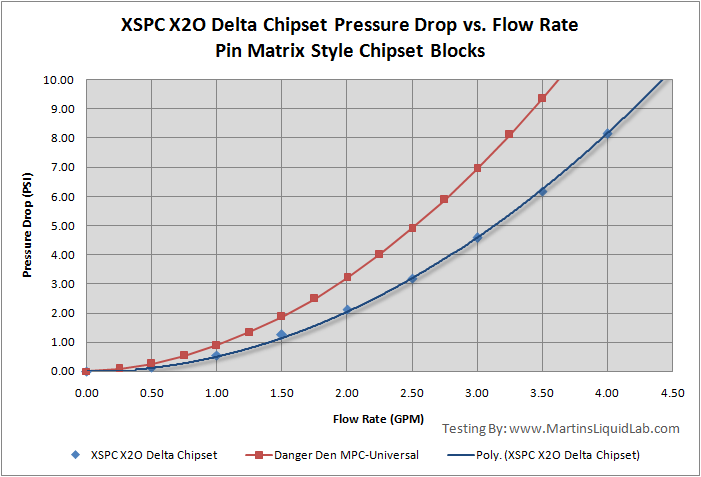 The flow rate characteristic for the XSPC X20 Delta Chipset is exceptionally good and the best "Pin Matrix" chipset block I've tested to date that incorporates an array of pins for maximum heat transfer and cooling. This will enable users to utilize the block in multiple block loops with very little impact to flow rate. Excellent!! 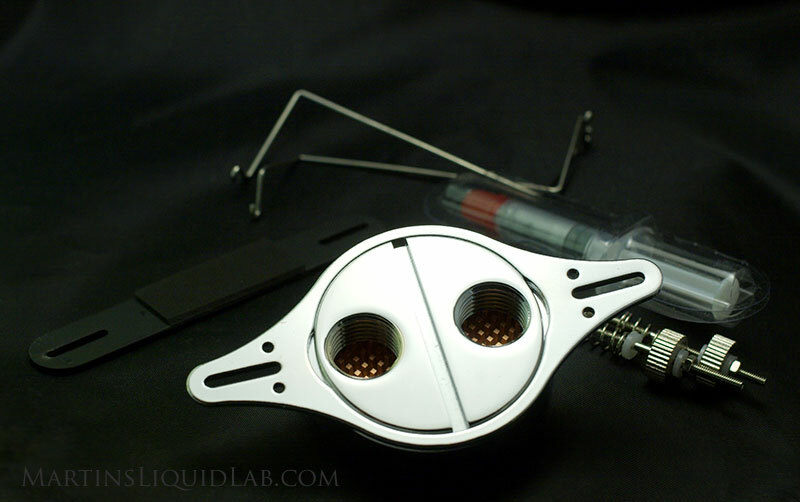 Copper base diamond pin matrix gives you CPU block performance in a chipset block package. This will mean excellent thermal performance. Back-plate!!!!! This is a first and very welcome addition, very very nice!! Lowest restriction for a pin matrix chipset matrix that has been tested to date. Not easily taken apart for detailed cleaning. Universal mount, so just check for clearances (compatibility), 16.8mm Tall, 44.0mm Diameter,54.5-75.2 bolt spacing. I'm really impressed with this chipset block, I'm sure it's very similar in performance to my prior top pick, the DD MPC-Chipset (Round pin matrix), and even manages a slightly lower pressure drop. 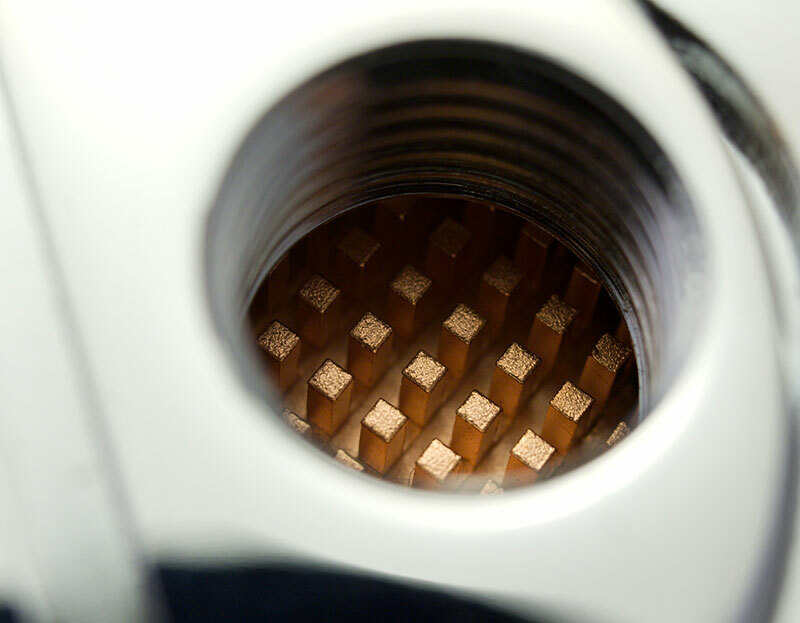 Pin matrix style chipset blocks will offer you the very best cooling. The XSPC X2O Delta chipset block is the only block that is a machined pin matrix CPU style design, has a solid brass top, and comes with a performance back-plate to maximum pressure and thermal performance while protecting your valuable motherboard. Now that's a chipset block focused on extreme performance!